Day 8. Disembark in Marmaris. An opportunity to swim from Ýztuzu Beach. 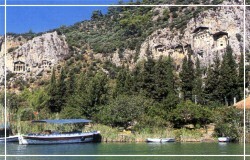 Sightseeing in Fethiye (ancient Telmessos). Swimming at Ölüdeniz (the inland sea). An overland walk to the ruined Greek town of Kayaköy. Shopping in the Marmaris Bazaar.